"Striving to be the best!" Stanislaus County (/ˈstænɪslɔːs/ or /ˈstænɪslɔː/) is a county located in the Central Valley of the U.S. state of California. As of the 2010 census, the population was 514,453. The county seat is Modesto. Stanislaus County comprises the Modesto Metropolitan Statistical Area. The County is located just east of the San Francisco Bay Area and serves as a bedroom community for those who work in the eastern part of the Bay Area. The first European to see the area was Gabriel Moraga in 1806. The region was named Rio Estanislao in honor of Estanislao, a mission-educated renegade Native American chief who led a band of Native Americans in a series of battles against Mexican troops until finally being defeated by General Mariano Vallejo in 1826. Estanislao was his baptismal name, the Spanish version of Stanislaus (Polish: Stanisław), itself the Latin version of the name of an 11th-century Polish Catholic Saint Stanislaus the Martyr. Between 1843 and 1846, when California was a province of independent Mexico, five Mexican land grants totaling 113,135 acres (458 km2; 177 sq mi) were granted in Stanislaus County. Rancho Orestimba y Las Garzas, Rancho Pescadero and Rancho Del Puerto were located on the west side of the San Joaquin River, and Rancho Del Rio Estanislao and Rancho Thompson on the north side of the Stanislaus River. Additionally, in 1844 Salomon Pico received a Mexican land grant of 58,000 acres (235 km2; 91 sq mi) in the San Joaquin Valley, somewhere near the Stanislaus River and the San Joaquin River in what is now Stanislaus County. However, the grant was never confirmed by the Land Commission. 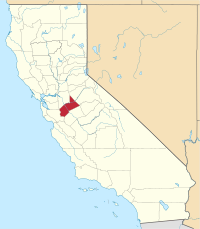 Stanislaus County was formed from part of Tuolumne County in 1854. The county seat was first situated at Adamsville, then moved to Empire in November, La Grange in December, and Knights Ferry in 1862, and was definitely fixed at the present location in Modesto in 1871. As the price of housing has increased in the San Francisco Bay Area, many people who work in the southern reaches of the Bay Area have opted for the longer commute and moved to Stanislaus County for the relatively affordable housing. According to the U.S. Census Bureau, the county has a total area of 1,515 square miles (3,920 km2), of which 1,495 square miles (3,870 km2) is land and 20 square miles (52 km2) (1.3%) is water. Stanislaus County has historically been divided socially and economically by the north-flowing San Joaquin River, which provided a natural barrier to trade and travel for much of the county's history. Isolated from the main rail corridors through the county and the irrigation projects that generated much of the region's economic prosperity, the part of Stanislaus County west of the river (known to locals as the "West Side" of the county) has largely remained rural and economically dependent on agricultural activities. Because of its proximity to Interstate 5 and the California Aqueduct some towns within this area, including Patterson and Newman, have experienced tremendous growth and are being transformed into bedroom communities for commuters from the nearby San Francisco Bay Area, while others (including Westley and Crows Landing) have been almost entirely overlooked by development and remain tiny farming communities. Stanislaus Regional Transit (StaRT) provides fixed route and dial-a-ride service throughout the county. StaRT also connects with Merced County Transit in Gustine and Turlock. Modesto Area Express (MAX) operates within Modesto, with limited service to Salida, Empire, and Ceres. MAX also runs special commuter routes connecting with the BART and Altamont Corridor Express rail systems. The cities of Ceres, Oakdale, Riverbank, and Turlock run small local bus systems. Both Greyhound and Amtrak have stops in Modesto and Turlock. Amtrak for Turlock actually stops in Denair. Modesto City-County Airport has previously had a number of scheduled passenger flights. Currently, its main air traffic is general aviation. Other (general aviation) airports around the county include Oakdale Airport, Patterson Airport, and Turlock Airpark. The 2010 United States Census reported that Stanislaus County had a population of 514,453. The racial makeup of Stanislaus County was 337,342 (65.6%) White, 14,721 (2.9%) African American, 5,902 (1.1%) Native American, 26,090 (5.1%) Asian (1.5% Indian, 1.1% Filipino, 0.7% Cambodian, 0.5% Chinese, 0.3% Vietnamese, 0.3% Laotian, 0.1% Japanese, 0.1% Korean, 0.1% Cambodian), 3,401 (0.7%) Pacific Islander, 99,210 (19.3%) from other races, and 27,787 (5.4%) from two or more races. Hispanic or Latino of any race were 215,658 persons (41.9%); 37.6% of Stanislaus County is Mexican, 0.6% Puerto Rican, 0.5% Salvadoran, 0.2% Nicaraguan, and 0.2% Guatemalan. As of the census of 2000, there were 446,997 people, 145,146 households, and 109,585 families residing in the county. The population density was 299 people per square mile (116/km²). There were 150,807 housing units at an average density of 101 per square mile (39/km²). The racial/ethnic makeup of the county was 69.3% White, 2.6% Black, 4.2% Asian, 1.3% Native American, 0.3% Pacific Islander, 16.8% from other races, and 5.4% from two or more races. 31.7% of the population were Hispanic or Latino of any race. 8.4% were of German, 6.3% English, 6.0% American, 5.5% Irish, and 5.1% Portuguese ancestry according to Census 2000. 67.8% spoke English, 23.7% Spanish, 1.5% Syriac, and 1.3% Portuguese as their first language. There were 145,146 households out of which 41.20% had children under the age of 18 living with them, 56.0% were married couples living together, 13.7% had a female householder with no husband present, and 24.5% were non-families. 19.4% of all households were made up of individuals and 7.9% had someone living alone who was 65 years of age or older. The average household size was 3.03 and the average family size was 3.47. In the county, the population was spread out with 31.1% under the age of 18, 9.8% from 18 to 24, 29.0% from 25 to 44, 19.5% from 45 to 64, and 10.4% who were 65 years of age or older. The median age was 32 years. For every 100 females there were 96.8 males. For every 100 females age 18 and over, there were 93.4 males. The median income for a household in the county was $40,101, and the median income for a family was $44,703. Males had a median income of $36,969 versus $26,595 for females. The per capita income for the county was $16,913. About 12.3% of families and 16.0% of the population were below the poverty line, including 20.5% of those under age 18 and 8.8% of those age 65 or over. The United States Office of Management and Budget has designated Stanislaus County as the Modesto, CA Metropolitan Statistical Area. The United States Census Bureau ranked the Modesto, CA Metropolitan Statistical Area as the 103rd most populous metropolitan statistical area of the United States as of July 1, 2012. The Office of Management and Budget has further designated the Modesto, CA Metropolitan Statistical Area as a component of the more extensive Modesto-Merced, CA Combined Statistical Area, the 62nd most populous combined statistical area and the 71st most populous primary statistical area of the United States as of July 1, 2012. As more cities in the county are becoming exurbs of the San Francisco Bay Area, urban planner and academic Wendell Cox wrote that the Office of Management and Budget could add Stanislaus County to the San Jose-San Francisco-Oakland, CA Combined Statistical Area in the future. The Government of Stanislaus County is defined and authorized under the California Constitution and law as a general law county. The County government provides countywide services such as elections and voter registration, law enforcement, jails, vital records, property records, tax collection, public health, and social services. In addition the County serves as the local government for all unincorporated areas. The Stanislaus County Sheriff provides court protection, jail administration, and coroner services for the entire county of 540,000 in population. It provides patrol and detective services for the unincorporated areas of the county. The Sheriff also provides law enforcement services by contract to the municipalities of Riverbank, Patterson, Waterford, Salida, and Hughson. These municipalities fund police coverage as specified in the respective sheriff's contract with each city. Municipal police departments in the county are: Modesto, population 213,000; Turlock, 73,000; Ceres, 46,000; Oakdale, 23,000; Acton, 8,000; Newman 11,000. Just like the neighbouring Merced County, Stanislaus is considered a bellwether county in presidential elections. It voted for the winning candidate for president in every election from 1972-2012. In 2012, Barack Obama won the county with 49.9 percent of the vote. The last Democrat to win a majority in the county was Jimmy Carter in 1976, although Barack Obama won a plurality in 2008 and 2012, as did Bill Clinton in both 1992 and 1996. In 2016, Hillary Clinton won the county but lost the election, the first time Stanislaus backed the losing candidate since 1968 when it voted for Hubert Humphrey. In the United States House of Representatives, Stanislaus County is in California's 10th congressional district, represented by Democrat Josh Harder. the 12th Senate District, represented by Democrat Anna Caballero. In the California State Assembly, Stanislaus is split between the 12th Assembly District, represented by Republican Heath Flora, and the 21st Assembly District, represented by Democrat Adam Gray. Agriculture is Stanislaus County's number one industry, with almonds being the primary agricultural product. The California State University, Stanislaus is a campus of the California State University located in Turlock. The Yosemite Community College District covers a 4,500 square mile area and serves a population over 550,000 encompassing all of two counties (Stanislaus and Tuolumne) and parts of 4 others (Calaveras, Merced, San Joaquin and Santa Clara). It is composed of 2 colleges: Modesto Junior College in Modesto and Columbia College in Sonora in Tuolumne County to the northeast. There is also a Kaplan College campus in Modesto, an ITT Technical Institute campus in Lathrop in San Joaquin County to the northeast, and a San Joaquin Valley College campus in Modesto. The Modesto Press is the local online news site for Modesto and the surrounding areas of the Central Valley. The Modesto Bee is a Modesto-based daily newspaper. The population ranking of the following table is based on the 2010 census of Stanislaus County. ^ "Stanislaus County". Geographic Names Information System. United States Geological Survey. Retrieved January 14, 2015. ^ "Mount Stakes". Peakbagger.com. Retrieved February 3, 2015. ^ a b c "American Fact Finder - Results". United States Census Bureau. Retrieved April 6, 2016. ^ KCRA News (August 3, 2011). "Proper Way To Say Stanislaus" – via YouTube. ^ a b c d e f g h i j k l m n o p q U.S. Census Bureau. American Community Survey, 2011 American Community Survey 5-Year Estimates, Table B02001. American FactFinder. Retrieved 2013-10-26. ^ a b U.S. Census Bureau. American Community Survey, 2011 American Community Survey 5-Year Estimates, Table B03003. American FactFinder. Retrieved 2013-10-26. ^ a b U.S. Census Bureau. American Community Survey, 2011 American Community Survey 5-Year Estimates, Table B19301. American FactFinder. Retrieved 2013-10-21. ^ a b U.S. Census Bureau. American Community Survey, 2011 American Community Survey 5-Year Estimates, Table B19013. American FactFinder. Retrieved 2013-10-21. ^ a b U.S. Census Bureau. American Community Survey, 2011 American Community Survey 5-Year Estimates, Table B19113. American FactFinder. Retrieved 2013-10-21. ^ a b U.S. Census Bureau. American Community Survey, 2011 American Community Survey 5-Year Estimates. American FactFinder. Retrieved 2013-10-21. ^ U.S. Census Bureau. American Community Survey, 2011 American Community Survey 5-Year Estimates, Table B01003. American FactFinder. Retrieved 2013-10-21. ^ "U.S. Decennial Census". United States Census Bureau. Retrieved May 31, 2014. ^ "Historical Census Browser". University of Virginia Library. Retrieved May 31, 2014. ^ "Population of Counties by Decennial Census: 1900 to 1990". United States Census Bureau. Retrieved May 31, 2014. ^ "Census 2000 PHC-T-4. Ranking Tables for Counties: 1990 and 2000" (PDF). United States Census Bureau. Retrieved May 31, 2014. ^ "American FactFinder". United States Census Bureau. Retrieved 2011-05-14. ^ a b "OMB Bulletin No. 13-01: Revised Delineations of Metropolitan Statistical Areas, Micropolitan Statistical Areas, and Combined Statistical Areas, and Guidance on Uses of the Delineations of These Areas" (PDF). United States Office of Management and Budget. February 28, 2013. Retrieved March 20, 2013. ^ a b "Table 1. Annual Estimates of the Population of Metropolitan and Micropolitan Statistical Areas: April 1, 2010 to July 1, 2012". 2012 Population Estimates. United States Census Bureau, Population Division. March 2013. Archived from the original (CSV) on April 1, 2013. Retrieved March 20, 2013. ^ "Table 2. Annual Estimates of the Population of Combined Statistical Areas: April 1, 2010 to July 1, 2012". 2012 Population Estimates. United States Census Bureau, Population Division. March 2013. Archived from the original (CSV) on May 17, 2013. Retrieved March 20, 2013. ^ "Contract Cities". Stanislaus County Sheriff's Department. Retrieved June 3, 2018. ^ a b c d e f g h i j k l m n o p q California Secretary of State. February 10, 2013 - Report of Registration Archived July 27, 2013, at the Wayback Machine. Retrieved 2013-10-31. ^ "California's 10th Congressional District - Representatives & District Map". Civic Impulse, LLC. Retrieved March 1, 2013. ^ "Communities of Interest — County". California Citizens Redistricting Commission. Archived from the original on October 23, 2015. Retrieved September 28, 2014. ^ Stanislaus County, California (2016). "Top 10 Commodities" (PDF). Stanislaus County Agricultural Report. ^ CNMP, US Census Bureau,. "This site has been redesigned and relocated. - U.S. Census Bureau". www.census.gov. John T. Bramhall, The Story of Stanislaus. Modesto, CA: Modesto Herald, 1914. Sol P. Elias, Stories of Stanislaus: A Collection of Stories on the History and Achievement of Stanislaus County. Modesto, CA: Sol P. Elias, 1924. A Memorial and Biographical History of the Counties of Merced, Stanislaus, Calaveras, Tuolumne and Mariposa, California. Chicago: Lewis Publishing Co., 1892.